My mom put me on a horse before I could walk, and I began eventing by age 8. I grew up riding at Hitching Post Farm in South Royalton and first started eventing on my Welsh pony cross. At Hitching Post Farm, I spent after school hours and weekends riding as many horses as possible, doing chores and learning all that I could. 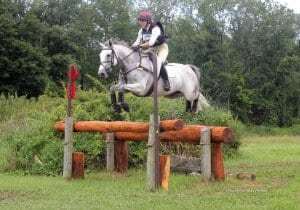 I competed through the CCI* level while at HPF, completing the 2004 NAYRC CCI* championships. In high school, I became a working student for Sue Berrill (Greylock Farm, Windsor, VT). She helped me compete my homebred Connemara gelding, Practically Perfect, through the intermediate level. At this time, I was also able to train with Denny Emerson. While in college at the University of Vermont, I started LBF Oleagh’s Image (“Leah”, a 2005 ISH mare that my mother purchased as a weanling) under saddle and began her competition career in 2010. She quickly displayed her bravery, scope and potential for the highest levels of eventing. After graduating from college, I decided to commit to bringing Leah along to the upper levels and pursue training and competing horses full-time. I relocated to Southern Pines (in Jan. 2012) to work for a friend from Vermont. That winter, I began riding horses for Annie Eldridge (Setters’ Run Farm, Duxbury MA & Southern Pines, NC). I started competing just one horse for her and the string of horses has grown over the last few years, ranging from 5 year olds eventing at training level to two-star horses, preparing to move up to Advanced. Annie also breeds her own horses, with the goal of producing upper-level prospects. Our plan is to continue to compete the current group of horses, while bringing along her homebreds. I enjoy training young horses and building a confident partnership and solid foundation that will enable them to succeed at the upper-levels. Leah has competed through the CCI** level and was named to the 2014 USEF Eventing 25/Developing Riders list. My goals are to bring Leah to the CCI4* level and to compete internationally for the United States.